Contact lenses come in a number of varieties and can correct many refractive eye conditions. Soft contact lenses are ideal for either intermittent or frequent wear. Hard contact lenses (RGP or rigid gas permeable) are available to treat conditions such as keratoconus and irregular or high astigmatism. Ortho-K is an exciting treatment which uses specially shaped RGP lenses to reshape the cornea during overnight wear, and provide clear vision during the day without the use of contact lenses or glasses. Somer Toprak has worn contact lenses for over 15 years, so he can relate to individual issues because he has gone through them himself. In fact, he has tried most contact lens materials and knows the ins and outs of wearing almost every single type. As their name implies, soft contact lenses are soft and flexible and their consistency is a little like a cross between jelly and rubber. It is very difficult to make them 'fall out' of your eye, and so are ideal for active people and those who are into contact sports. The latest soft contact lens materials are usually so comfortable that sometimes you can forget you are wearing them! The vast majority of soft contact lenses used today are the disposable variety. These are designed to be used for either 1 day, a fortnight or a month at time before disposing and using a fresh contact lens. Daily contact lenses are convenient in that no cleaning is required. A fresh contact lens is worn at the start of each day. This also eliminates problems due to protein and lipid interaction with the contact lens. 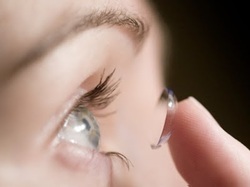 Fortnightly and monthly soft contact lenses are worn during the day and removed overnight. They require daily cleaning and disinfection. They are replaced with a fresh lens after the fortnight or month of use has been reached in order to keep lens deposits to a minimum. Soft contact lenses come in single vision for short and long-sightedness. They are also available as toric lenses to correct astigmatism. Multifocal soft contact lenses are also available for those who need a reading prescription as well as long distance correction. For new contact lens wearers soft contact lenses are generally more comfortable and easier to get used to than hard contact lenses. Comfort depends on many factors, such as the fit of the contact lens on the eye and the material the lens is made from. The fit of a soft contact lens is assessed in a number of ways. When fitting your contact lens we check for centration, movement and tightness. A good fitting lens will sit centrally on the cornea, move enough to allow tear exchange behind the lens for a healthy cornea, but not be too loose so as to show excessive movement. When fitting toric lenses for astigmatism, the lens has to rotate to the correct axis on the eye. Oxygen permeability is important, especially for someone who wears their lenses almost everyday. The more oxygen that gets through the lens, the less likely you will run into long term problems such as corneal neovascularisation. The water content and wettability of a lens can effect how quickly a lens dries out, and in turn, whether your lenses feel comfortable for most of the day. The interaction of your tears with the contact lens surface is also assessed - some people deposit more lipids or proteins on certain types of contact lens materials. This problem can be overcome by selecting materials more biocompatible with a particular individual's tear chemistry. Lastly, the 'softness' of a contact lens material can also play a role in comfort. Older soft contact lens materials were more rigid and led to problems with inflammation under eyelids. Newer materials are softer and less likely to lead to these issues. Every individual is different, and thus each of these factors has to be assessed on an individual basis. What may fit and be comfortable on your eye may not necessarily be the best lens for someone else. People who are fitted with contact lenses that aren't compatible with their eye generally start to have issues someway along the track. This can be solved by refitting with a lens that performs optimally in every one of the above parameters.